getsix® Services offers Microsoft Dynamics Navision (NAV) services for our hosted Environment as well as for premise installations. We understand the unique needs and budget constraints of small and mid-sized organisations, and have designed Microsoft Dynamics NAV solutions specially tailored to meet their needs. 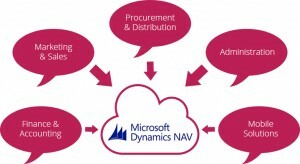 Our Microsoft Dynamics NAV practice helps automate and streamline business processes. Our matured practices with expertise across domains and technology enable clients to increase efficiency and productivity, while reducing cost. Open, yet secure: Microsoft Dynamics NAV’s object-oriented development environment and source code make it quick to customise, maintain and connect to other systems in an easy and secure way. Reliable database: The Microsoft Dynamics NAV Database Server serves as a single version of truth and is reliable with a robust security system that allows assigning of different access levels to control access to data. Global solution: Microsoft Dynamics NAV which is available in more than 42 countries is a global solution, with all relevant country-specific statutory requirements already taken into consideration. Access information in multiple languages: With Microsoft Dynamics NAV, it is possible to serve customers and vendors better by providing invoices, inventory descriptions, printed reports, etc. in a language and currency preferred by them. Switching between installed languages on-the-fly is also very easy. Customisable reporting criteria: Reporting and analysis criteria can be set based on specific business needs. Business analysis: Microsoft Dynamics NAV’s set of easy-to-use analytical tools enables enterprises to take better control of their business and enhances decision-making capabilities. Financial budgets and reports: Budgets and sub-budgets can be created and maintained in easily comprehensible matrix forms. Better warehouse management: Put-away and picking processes make warehouse management efficient and easy, thereby reducing labor costs. With serial numbering and lot tracking, it is possible to trace items at any time during the sales, purchase or transfer process. Decision making: Microsoft Dynamics NAV increases visibility into the business thereby facilitating faster and informed decision making. Maximise IT investment: The Microsoft Dynamics NAV solution can be extended to multiple locations while leveraging the existing IT environment. With our Microsoft Dynamics NAV services we are able to respond quickly and efficiently to changing business needs and therefore it accelerates business growth for our Customers. Like all other Microsoft Office productivity tools, Microsoft Dynamics NAV is fast to implement, easy to configure, and simple to use. getsix® Services has witnessed several changing trends in the IT industry and can now deliver avant-garde solutions and applications to our clients. We have designed and deployed several versions of Microsoft Dynamics NAV for our clients and organisations. We not only deploy MS Dynamics NAV from start to finish for our clients, but also upgrade their previous versions of Navision to the latest MS Dynamics NAV. 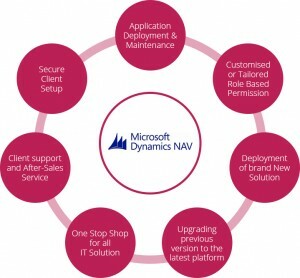 We can also provide MS Dynamics NAV ‘Add On’ development and deployment facility for our clients.